It's Spring....eventually the snow will melt & the temps will go up. What says warmer weather better than a car show. If you haven't entered the Speed challenge for awhile or ever or your new to the site, now is a good time to give it a go. No rules other than let your imagination run wild. Photoshop away. Challenge runs until Friday night, March 28th. Cool entry Don. 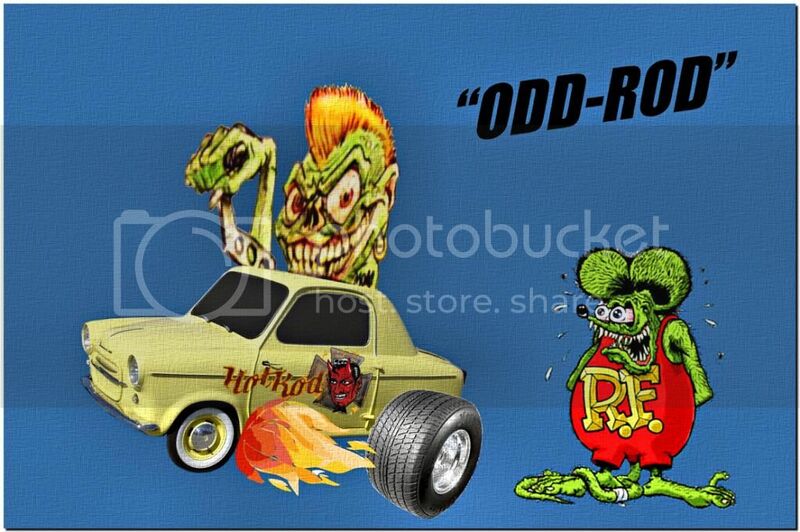 Rat Fink brings back memories. I grabbed that engine from the display in the background. Had to flip it to fit so the mags are an the wrong side. Oh well, probably won't fire it up anyway. Front wheel is from the car in the background, mounted the original tire on it though. Rear wheel is off the California Charger Nostalgia Funny Car. The chutes & rear wing are backwards too, off a top fueler. I'm not fast enough to ever get in front of one of those. Gotta use what's handy I guess. Bumpity Bump, ... this place is a Ghost Town! lets get them creative juices flowin' & get Funky! Oh feces, I didn't account for the hot babe's arm on the right. Don, I also have fond memories of Rat Fink & Big Daddy. I have Close Enough For Rock & Roll Fun doin' these but you have Fine Enough For Disney Fun. Thanks Tor. I did this one yesterday while watching the NASCAR guys drive in circles.